The two parts of a floochie - each floochie has a fly inside a hoochie. What are floochies? A floochie is a hoochie with a built in hard-head fly insert. Invented by Alaskan fishing guides and made in custom fish-catching colors. Each floochie is 4.5 inches long. All floochies have glow eyes. You can pull the fly out and use each piece separately. 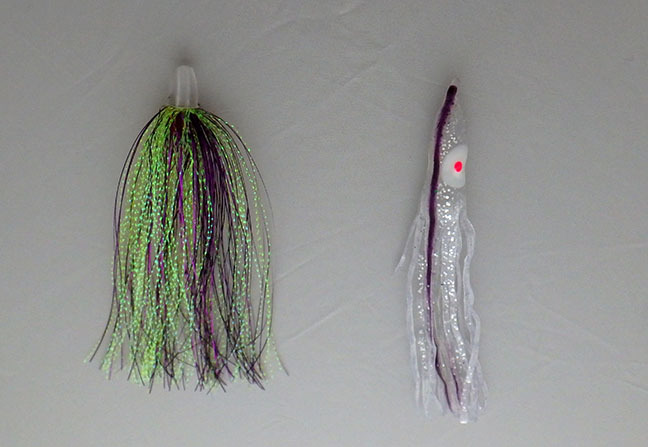 If you are not in the USA please shop for floochies at SquidLures.com. 4.5 inch floochies in strawberries & cream color. Package of 3. Pink and white with UV, silver, and sparkles. 4.5 inch floochies in UV green glitter color. Package of 3. Green and pink with UV and sparkles. Purple and sparkly chartreuse inserts. All orders ship by US mail. Click product photo for larger image. SECURE CHECK-OUT!